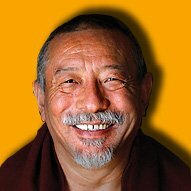 Thirteenth Zasep Tulku, Archarya Zasep Tulku Rinpoche is an engaging and respected Tibetan Buddhist Guru who is spiritual director for Gaden for the West. 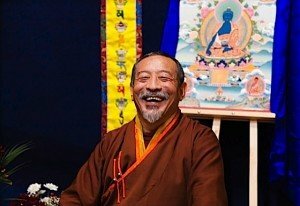 The most Venerable Zasep Rinpoche guides a full Medicine Buddha healing visualization meditation followed by the amazing vocals of Yoko Dharma chanting the Medicine Buddha mantra for several minutes. 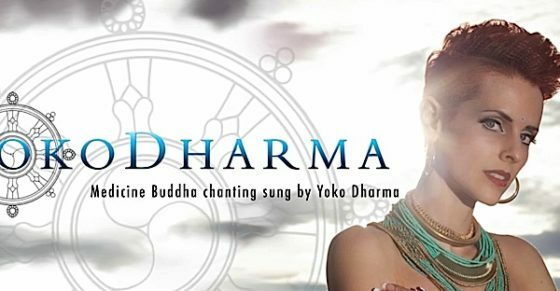 Sit straight, close your eyes and let Rinpoche guide you with the healing light and nectar of the great Medicine Buddha, then chant along with Yoko Dharma for healing activity. 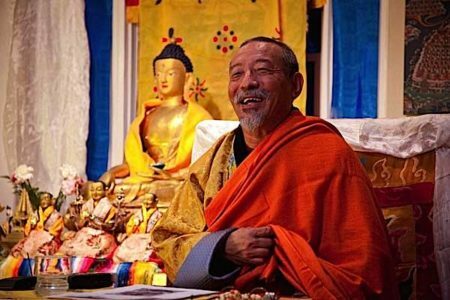 Zasep Rinpoche: “I would like to lead meditation on Healing Buddha, Lapis Lazuli Light, and visualization of the lights, reciting the mantra. I would like to ask everyone to sit comfortably on a cushion, or on a chair. Keep you back straight. Relax your body. Then we visualize Medicine Buddha in front of us. 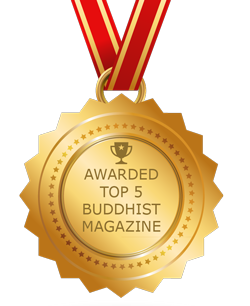 Lapis Lazuli Light Medicine Buddha. Not too far, and not too close; about one meter from us, in this beautiful blue sky. Visualize a beautiful Lapis Lazuli blue-coloured Medicine Buddha. Lapis Lazuli Light Buddha is sitting on the lotus cushion and moon cushion. 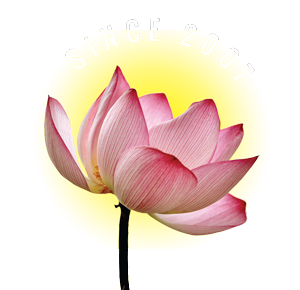 The lotus cushion is made with lotus petals, white and pink lotus petals. And, on top of that, visualize a moon disc, horizontal. Lapis Lazuli Light Buddha has one face, two hands, and he is sitting cross legged in the Vajra Asana, wearing a beautiful robe of a monk, saffron and burgundy robe. His left hand is in the mudra of meditative equipose, holding bowl with white nectar inside. His right hand is hollding an Aruna plant. It is also known as a Myrobalan. It’s an Aruna plant with seed or fruit, and some leaves and a little bit of flower. Lapis Lazuli Light has a blue colour, deep blue Lapis colour. Also, imagine there is light shining behind his body, behind his head, beautiful light, yellow light and golden light. Different colours of lights coming and going, gently coming and going. 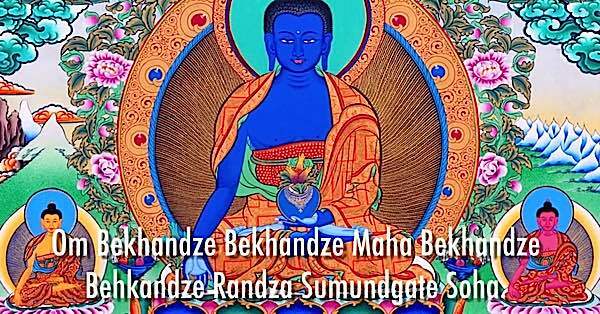 Then, when you visualize Medicine Buddha, imagine Medicine Buddha is here, with you; real one, he is alive, he is here with us. His body is the nature of light and energy. Transparent, the nature of light. Not a solid, material body like our body. But, an energy body. 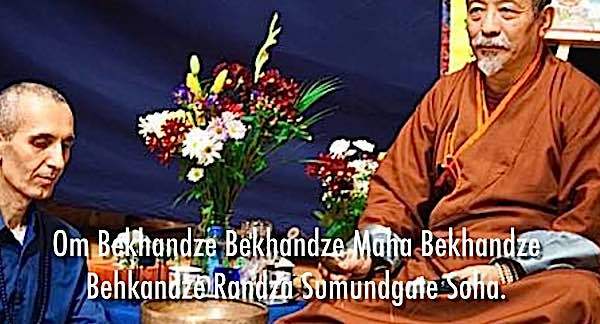 This is the Tibetan pronounciation, Om Bekhandze Bekhandze Maha Bekahndze Bekhandze Randza Sumundgate Soha. Om Bhaishajye Bhaishajye Maha Bhaishajye Bhaishajye Raja Sumudgate Svaha. Svaha. Tibetan pronunciation is Soha. So, either way is fine. 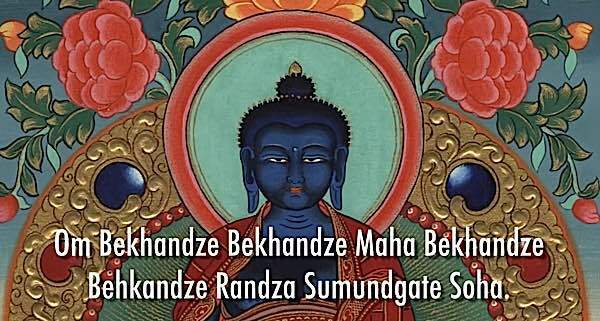 You can say it the way Tibetan’s say it or according to Sanskrit. It doesn’t mtter which way. The most important thing is devotion and faith. It works. It worked in that past, all those years. Hundreds of years. There’s so much suffering in this world, it’s like the ocean. Sickness, death, and so on and so forth. So “please help me”, Sumudgate Svaha. Say this mantra as much as possible. You can say it the way I did it, or you can say it quietly. So, you say the mantra first, for awhile, and then you do the visualization. Now, the visualization is an important one. 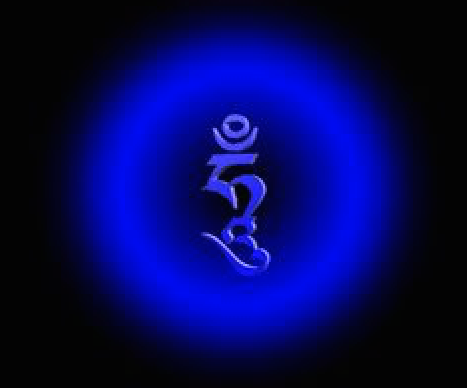 When you are saying the mantra, or after you say the mantra, imagine beautiful blue light shining from his heart. In other words from his chest. And you visualize a small syllable, Seed Syllable HUM. Hum or Hung at his heart on a moon disk. [see inset.] And the blue light emanating from his heart. Zasep Tulku Rinpoche teaching at a Medicine Buddha weekend in Toronto, hosted by Theodore Tsaousidis (left). 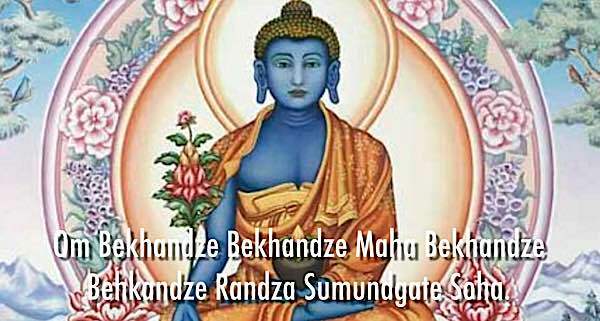 Tibetan “Hung” or “Hum” syllable visualized at Medicine Buddha’s heart. The blue light is descending, comes down, and first enters your crown, then slowly descending to the throat, and then to the heart, and then inside your body — all over your body. Everywhere. And the blue light entirely fills your body. This light is healing light. This is Holy light. This is Divine light. It purifies you entire body. Completely purified. And your causes of suffering — pain, disease, suffering — are all gone. Imagine! It’s all gone! Also, you could imagine you have received healing energy. Not only purifying your body and sickness, but you receive healing energy, healing inspiration — to heal yourself! 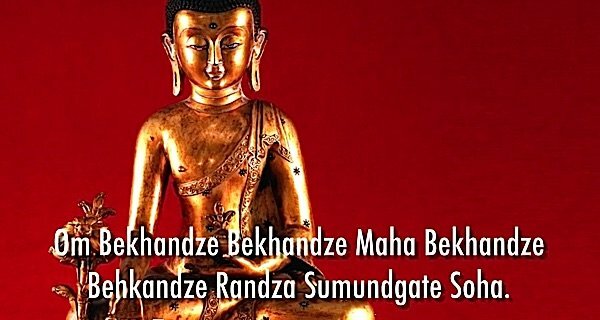 You can heal yourself by reciting the mantra. You receive healing confidence for yourself. And you can also do some healing for others. So, light first. Then, you say the mantra again, or you can sing, the way I did, and also you can say it quietly, and this time visualize nectar coming down. 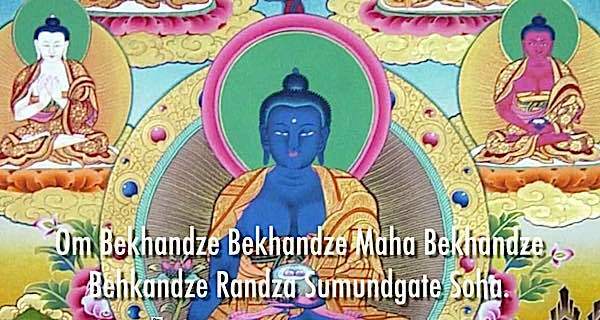 So, Medicine Buddha’s bowl is in his left hand. There’s white nectar inside. As you say the mantra, you imagine white nectar descending down from the bowl to your crown, and enter into your body, first to the crown, then to the throat, then to the heart, then navel, then all over your body. This nectar is medicinal nectar. It has all the properties of medicine to heal your body, to nourish your body, and renew your body, and to sustain your body. So, imagine this white nectar flowing down like a waterfall, like water coming down from the rocks or the roof, like that, beautiful nectar flowing from the bowl, then into your crown, then your entire body is filled with nectar. Imagine you feel very nourished. And you feel very blissful. Blissful!! Tibetan word is “Dewa.” Dewa, you can feel the happiness, you feel the blessing of Medicine Buddha enters your body. Now, you are also nourished. Also, you are protected. Your body is protected. Your mind is protected. Your body is protected from external causes of illness — viruses, germs, pollution, and so forth. You have protection. You have energy inside which can neutralize any kind of cause of illness. It will neutralize and purify. Now, you imagine Medicine Buddha becomes very small, blue light and small, and transforms into blue light, small blue light, the size of your thumb. The small blue light enters in through your crown and down to your heart. That Divine Light, the Medicine Buddha’s Divine Light, enters your heart. 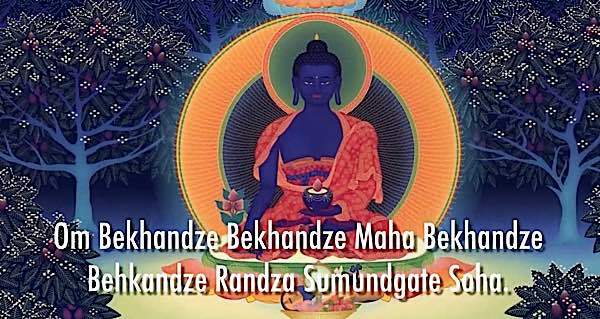 It’s here with you as a protection and blessing of Medicine Buddha.